"Not for ourselves alone are we born. - Cicero"
Domenico joined Watsi on March 12th, 2013. 1,775 other people also joined Watsi on that day! Domenico's most recent donation traveled 5,700 miles to support Khuth, a grandmother from Cambodia, to see clearly again. Domenico has funded healthcare for 77 patients in 14 countries. Khuth is a 70-year-old woman from Camboida, who is married with four daughters and ten grandchildren. She likes to go to the pagoda and watch Khmer dramas on TV. Khuth heard about Children's Surgical Centre (CSC) from a person in her village who had surgery there before. She traveled for three hours with her daughter to reach CSC for treatment. Khuth developed a cataract in each eye about one year ago, causing blurred vision. It is difficult for her to see things clearly, do any work, and go anywhere outside. Khuth will have surgery consisting of a phacoemulsification procedure (to break-up and remove the cataracts) and an intraocular lens (IOL) implant in each eye. This surgery will allow her to see clearly again. 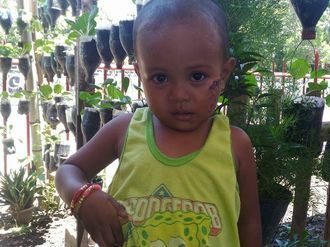 $292 will cover the costs of the surgery and care Khuth needs. Khuth says, "I hope I can see everything clear again so that I can go anywhere outside without needing to disturb others to take care of me anymore." One-month-old Dickson is the first child born to his parents. His mother works at a small drug store as a store keeper and his father is a small-scale farmer – he relies on growing maize and beans. Apart from being born with congenital bilateral clubfoot, Dickson is a cute baby, healthy and growing without problems. Bilateral clubfoot is a birth defect in which the foot is twisted out of shape or position. Doctors at Watsi's medical partner recommended surgery so Dickson will be able to walk normally in the future. The cost of treating clubfoot is just too high for Dickson's parents to afford. Treatment, which costs $1,160, will prevent him from using the lateral aspect of his feet for walking when he starts to walk. “We just pray that our son’s feet can be straightened to allow him to walk like other children and later on go to school,” shares Dickson’s mother. Luis is a six-month-old baby living in Guatemala with his grandparents and mother in a cinderblock house with a tin roof. His favorite thing to do is to play with a small rubber toy dragon. When she isn't caring for Luis or helping Luis's grandparents around the house, Luis's mother is a tailor. She is a single mother, and is unable to afford more food for Luis than corn tortillas. Luis has been diagnosed with severe chronic malnutrition. He is almost three standard deviations below a normal height for his age. He has not been receiving the calories and protein he needs, stunting his growth and weakening his immune system. He frequently gets diarrhea, fevers, and coughs, all of which contribute to lethargy and decreased appetite. Without treatment, Luis could face long-term consequences such as low IQ, increased risk of chronic diseases, and lower earning potential as an adult. 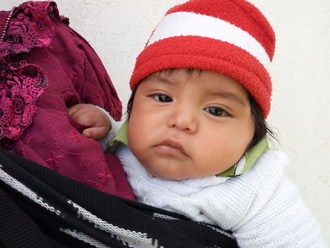 For $512, Luis can receive the treatment he needs to resolve his malnutrition. His treatment cost covers growth monitoring visits, food supplements, and medication to help him gain weight and develop properly. Luis's mother is eager for financial assistance to afford Luis's treatment. "I hope my son recovers soon from malnutrition," she says. Luis's treatment will strengthen his immune system, increase his overall caloric intake, and make it so he has more energy to play and learn. His mother will also receive nutritional education to help her optimize the diet he needs. This is Sinet, the last-born in a family with three children. Sinet’s mother is a housewife while her father is a pastoralist. The family lives in a traditional hut in the North Eastern region of Kenya. Sinet was born with a swell on her abdomen and as she grew, so did the swelling. In normal circumstances, the swell disappears as the baby grows older. However, Sinet's did not disappear. Sinet's parents tried to treat her with traditional herbs, but that did not reduce the swell and instead, it got bigger. Sinet and her family came to Bethany Kids Kijabe Hospital for specialized treatment, and they were told Sinet's umbilical hernia would need surgery. However, the umbilical hernia repair comes at a cost that Sinet's parents cannot afford. If it remains untreated, Sinet may suffer intestinal incarceration, obstruction, and/or strangulation. With $430, Sinet will receive the medical attention she needs and hospital respite to recover smoothly. Sinet's mother shares with us, "I have never known life to be easy and to acquire anything we have has been a real struggle. I knew this too wouldn’t be easy after trying traditional treatment with no results. I am hoping I will get help in this hospital and perhaps educate my fellow villagers about the importance of modern medicine compared to the traditional way." Our support will help Sinet develop into a healthy, young girl. “We are not in a position to raise the funds needed for our daughters’ surgery,” says Shantel’s father, “but we are asking for help in ensuring her well-being.” Shantel is a beautiful nine-month-old girl who lives with her parents and older sister in a two-room rental house in Kenya. Like most babies, Shantel was born with a protruding navel. But whereas in most cases the navel retracts with time, Shantel’s belly button remained swollen. This worried her parents, and when they consulted doctors, they learned that their baby has an umbilical hernia. This means that the hole through which Shantel’s umbilical cord passed did not close as it should have after the cord was cut, and tissue has pushed through the opening. Shantel needs to have surgery to repair her hernia. If she isn’t treated soon, Shantel could experience life-threatening complications, such as abdominal incarceration, obstruction, or/and strangulation—conditions where parts of the protruding tissue become cut off from blood flow. Shantel’s parents were able to raise $52 for Shantel’s surgery, but that is not enough to cover their child’s surgery. Shantel’s father is a subsistence farmer and supplements his income by doing casual tasks, while her mother stays at home to take care of their two children. $430 will cover Shantel’s hernia repair operation, as well as her lab tests, medications, and two-day hospital stay. Let’s help get Shantel’s young life back on track. Kyle is a seven-month-old baby living in Kenya with his parents. Immediately after birth, Kyle underwent surgery to remove a swelling mass on his lower back. He was underweight, and spent the first month living in the nursery while he recovered. Kyle's mother was forced to quit her job to care for Kyle while he was being treated. Kyle's father works as a graphic designer, but is not fully established yet. At three months of age, Kyle became irritable and his head over-grew his body. Kyle was diagnosed with hydrocephalus, a congenital condition where there is excessive accumulation cerebral fluid in the head that causes increasing pressure and swelling. He had a shunt inserted in his head to drain the excess fluid, but three weeks later he developed an infection. He spent the following three months hospitalized to fight the infection. The shunt had been removed, and now he is fully recovered from the infection, however he now needs another shunt to ease the cranial pressure he continues to experience. If not treated, accumulation of cerebral spinal fluid may cause brain damage. Kyle has lost some weight due to frequent vomiting and he seems irritable due to the high intra-cranial pressure exerted on the brain. His parents have exhausted their savings on his treatment thus far for his original surgery, hydrocephalus, and infection, and are still repaying debts from their friends. Our medical partner, African Mission Healthcare Foundation, tells us that for $615, Kyle can receive the procedure he needs to reduce risk of brain damage. The total cost also covers the medications, supplies, imaging, and five days of inpatient care. “I really hope that my son will get a shunt that will work this time around," Kyle's mother shares. "We have done all we could, and now all is left is to pray and hope that this is the last time he will be admitted because it hurts so much to see him cry in anguish." Three-year-old Armand had a colostomy when he was two, after his parents noticed he had trouble passing stool. "After the colostomy procedure, his parents struggled buying all the needed medication and dressings for Armand, and their finances dropped so they were not able to follow-up his treatment," reports our medical partner, International Care Ministries (ICM). Armand and his family live in the Philippines, and were referred to ICM's medical program. He was finally able to have a pull-through operation last December to correct the damaged portion of his colon, allowing him to pass stool normally. Now, he needs a final surgery to close the existing colostomy. ICM shares, "According to his mother, every morning when she changed Armand's colostomy bag, he always told her that he wants to go to school someday without his colostomy. His mother said that she want to see Armand grow free from his condition and live a normal life like other kids." Armand's father earns about $24 per month as a sugarcane worker, and his family can't afford to pay for his final surgery, which costs $1,500. "Now, that Armand is on the last part of his treatment, the closure of his colostomy, the family is happy and hopeful that they can start anew after this. They are looking forward to Armand having a brighter future ahead of him being free from the threat to his health." Two-year-old Princess "is a playful girl and very cute," reports our medical partner, International Care Ministries (ICM). "She was loved not only by her parents but her neighbors and friends as well. She loves to play with kids around the neighborhood like they are living in a castle and she and her friends are princesses and princes." Princess lives in a mountainous part of the Philippines with her parents. Recently, her mother noticed a mass near her reproductive organs and sought care for her. "The mother did not hesitate to coordinate with the health staff to subject Princess for consultation to a surgeon," ICM explains. "Tests were performed including ultrasound and she was diagnosed with indirect inguinal hernia and surgery is needed. They cannot afford the surgery needed for Princess because of financial constraints." Princess' hernia is causing her pain, and her mother has had to stay home from work to care for her. For $465, we can pay for surgery to repair her hernia, allowing her to live a normal life. "I am thankful for the sponsors and donors who are very willing to help us. Princess is really a princess to her small kingdom we called our home. Thank you for making her wish come true," Princess' mother says. 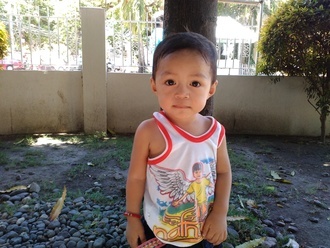 Romart is a 17-month-old boy from the Philippines, who is dearly loved by his parents. He enjoys playing and entertaining his mother by dancing, and he giggles a lot. Romart was diagnosed with an inguinal hernia. His parents are worried for him, but they could not bring him to a doctor because their limited source of income is from collecting garbage and selling it in a small junk shop. On occasion, Romart's father works as a "sakada", a sugarcane laborer in the fields near their town to earn $3 a day. His parents just want what is best for Romart, and after surgery they hope Romart will grow up normally like other children. "We really couldn't believe that help could be given to us. At first, we were afraid that Romart needed surgery, but the doctor explained to us that this is the best way for Romart to heal. I am very thankful for your help and I pray for a successful surgery for my son," his mother shared. $1,437 will fund the hernia repair surgery that Romart needs. Let's help make it possible. King's is a shy three year old boy, the first born of two children. He lives with his parents and younger brother in a single-rental house in Nairobi suburbs of Kenya. King's mother is a tailor while his father works in an electronic shop. This past June, King's mother noticed a slight swell on the right upper side of King’s abdomen. King's had always complained of pain, but his parents took it lightly, assuming that he had been hit by his friends while playing. Last week, King's extreme pain reached a point where he cried and clutched at his abdomen. A visit to the local hospital revealed a congenital health condition. King's has a right undescended testis and a surgery is required to fix it. If it remains untreated, King's could develop an inguinal hernia or other complications. $540 in funds will cover all surgical expenses and necessary medications. A surgeon will perform an orchidopexy to locate the testis in the abdomen, lower it into the scrotum, and place it in a fixed position. King's parents wish that their income could cover King's surgical care. "We wish to give King's the opportunity to be able to follow his dreams and ambitions in life, but we feel helpless that we cannot give this to him." Our support will go a long way in helping a family provide their young toddler the medical treatment he needs. Meet Blessing, an adorable baby girl born to loving parents in Kenya. Her mother is a housewife while her father works in a hardware store. Ever since she was born, Blessing has had a series of health complications. Born with a mass swell on her lower back, Blessing underwent surgery which repaired her back two weeks after birth. A few weeks later, Blessing developed an infection and was readmitted in hospital for care. Just as she was getting better, the doctor diagnosed her to have hydrocephalus, a condition where one is found to have excess fluid in her skull. This condition is associated with a progressive increase in head circumference, headaches, and irritability. The resulting increased intracranial pressure can lead to brain stem compression. All the while, Blessing’s parents have been looking for financial support from family and friends, so that Blessing can receive the treatment she needs. Her parents are now in a dilemma as they are not in a position to raise the funds required for surgical care, let alone repay the debts. Watsi's medical partner will provide the surgery she needs to divert the excess fluid from her brain to her abdomen. The excess cerebrospinal fluid will then be drained and can relieve the overwhelming pressure on her swelling brain. In tears, Blessing's mother shared: "Blessing has spent most of her life in the hospital. We have incurred so much debt and we are not even close to clearing any of it. Watsi will be life saving." This is Esther, a one-month-old girl from Kenya. She was born via caesarean section after a scan revealed that her head was abnormally big and normal delivery would not be an option. Esther’s parents took her to a neurosurgeon, and there she was diagnosed with hydrocephalus, a disorder where extra cerebrospinal fluid accumulates in the cranium. This condition could become painful for Esther as the liquid presses against her brain. And if untreated, the long-term consequences could be severe. To avoid these outcomes, Esther needs to have a shunt surgically implanted in her brain. The shunt will help drain the fluid away from her head so that the swelling subsides. Esther’s parents were relieved to hear that their child has a good chance of survival if she undergoes this procedure—but they cannot afford it. Esther’s mother is a stay-at-home mom, and Esther’s father has just founded a research business that is financially struggling. With the little savings they had, Esther’s family have managed to raise $52, but this falls short of the funds required. “I am in a financial crisis and would appreciate anyone who contributes to Esther’s treatment,” Esther’s father says. For $615, we can make up the differential that lies between Esther’s family and the operation their baby needs. This funding will also cover the medications, lab tests, and five-day hospital stay that will accompany Esther’s surgery. Let’s help Esther’s family make it through their financial straits so that their one-month-old can grow into a healthy and strong little girl.